Going to auctions, saving horses from different horrible situations somehow, replays quite the same in my head. I see their faces, how they almost instinctively know we have come to save them. They reach out with what strength they have left and briefly touch a soft nose to us as if saying “please take me.” You may hear a half hearted nicker as you pass their stall or just watch them stand there in a blank space of sheer miserable survival. Often times you see the before and after photos and stories of successful transformations. I see the honest, scared soul moments before they get saved all throughout their time with us. There is a rawness of vulnerability in looking at each other in such a place. And there we stand human and horse looking back at each other. Us pretending to be brave for them, and them standing there a silent defeated being living on hope alone. And they hope, they shut down, cling to whatever they can to get by. It takes some time for the very worst cases to emotionally come back. The horses starved to death will stand in their stalls with empty, blank eyes for weeks before they decide to let the walls down. 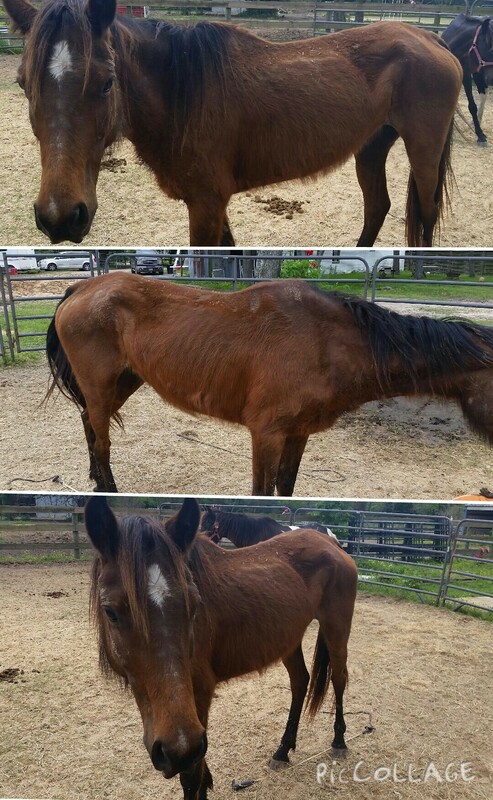 Rescuing horses isn’t about the pictures, the success stories, the bigger story to get noticed. It’s about being able to pull a lost soul out of the depths of their own personal hell. Rehab their whole body, heart and mind. It’s hours upon hours of neverending work for absolutely no personal gain whatsoever. Other than knowing you’ve made a difference to that one horse. This entry was posted in Uncategorized on April 9, 2015 by crossfirerescue. This is so beautiful and filled with the honest emotion of the situation that it brought tears to my eyes! It must be so hard to go through so many emotions. When Sparrow finally arrived I wanted to cry. It was confusing for her and you could see the distrust in her eyes. Today Brittany was able to braid her mane and put a halter on her- It was a bit comical watching Sparrow put her face into every corner to try to hide. She will approach the gate to her stall if I stand there with my hands behind my back and once in a while she lets me pet her. Patience is going to be the key and that is our plan for Sparrow. We want her to learn how to trust and be loved. She’s a sweet girl under it all we can’t wait to see her blossom!